St Martin is the official name of the French half of the island of St Martin / St Maarten, the smallest island in the world under the governance of two countries, France and the Netherlands. St Martin comprises the north part of the island, an area of about 52 square kilometres where tourism has now superseded the traditional salt and sugar industries. Although there has been some development, the French side is still less developed than Dutch St Maarten. The emphasis in St Martin is on comfort and elegance: the beaches are secluded, the luxury resorts provide lavish accommodation and the restaurants offer some of the finest dining experiences anywhere in the Caribbean. Attractions include the nature reserve covering the north end of the island; and the museum located in the original Fort St Louis overlooking Marigot, the main town and capital of St Martin. A charter here would not be complete without a visit to the small islands of Tintamere and Isle Pinel. Although tourists do frequent Isle Pinel, Tintamere is quieter, with an idyllic beach and no services on shore – hence is perfect for a private picnic, and you can even take a mud bath! Orient Bay is the place for watersports enthusiasts with good conditions for sailing dinghies, kite- and wind-surfing or parasailing. Dual nationality has led to some great benefits for the island and for those who visit. The island maintains its tax-free status and travel from one side to the other is unobstructed, in fact the border is almost imperceptible and you may cross back and forth without even realising you’ve been in a different country. Although the official language is French, many people speak English as well, especially in the marinas and tourist areas. 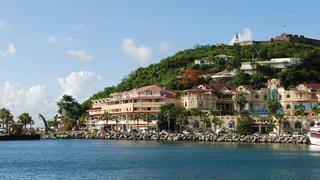 This makes St Martin a wonderful mix of the cosmopolitan and traditional West Indian culture.